We left work early on Friday in order to make the drive up to Brookfield, WI in time to pick up our numbers and swag, stop for dinner, and make it to Janesville in time to spend a little bit of time with family before we started our final prep for the next day and hit the sack. All day I'd had a little bit of that blech feeling you get when a cold is trying to invade, so I was sucking down even more water than usual and upping the vitamin C. Ultimately, I knew it was nothing a good long run couldn't fix :) I was right. We woke up at 2:00 the next morning (yes, I'm serious) and were packed up and out the door by a little after 3:00. 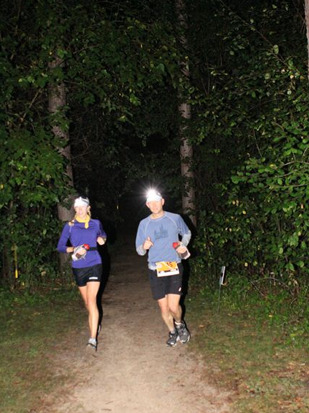 We had about an hour's drive east to Ottawa Lake Campground (the race's start), and were warned to allow plenty of time to walk from the parking lot to the race start, and we had to have our drop bag there by 4:30 a.m. Seemed a little excessively cautious on their part. It was. We were both surprised by how few people there seemed to be (~160 runners in the 50M) compared to two years ago, but it was nice to know we'd have some space on the trail. After a little speech by someone up front (was it DK?) we were off! I immediately felt great. Running has a way of doing that. After the brief road section, we turned onto the trail and the real fun began. It was a little jarring at first running with a headlamp again (it's been awhile! ), but it's like riding a bike I suppose. We were moving really, really well and moving through the pack with ease. Before long we were just behind the front fasties and enjoying the smooth and fast pace. Or, at least I was. Geof was a little more weary about moving so fast so early, but more for my sake than his (Geof's a fastie). We rolled into Scuppernong (somewhere between 6-7 miles in) while it was still completely dark out and I recalled the sun had already come up by the time I got to this point back in 2009. Score. It was here that that "something else" started to come to fruition. Volunteers shouted, "Second woman, second woman!" 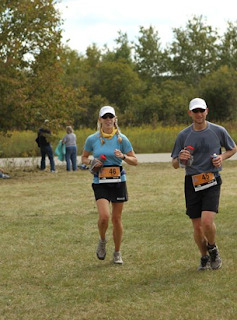 as we rolled in and straight through the aid station. My stomach lurched in excitement at the announcement, but at the same time I really didn't want to hear something like that so early on and get too ahead of myself. Coming into Scuppernong, blinded by the flashing of the camera, wowza! We kept moving through and turned back onto the trail on the other side, looking for the markers and following the direction of volunteers sending us down the trail. Enter: The Groundhog Day loop. I was busy focusing on not falling flat on my face as we worked our way through an extremely rocky section. It was like moguls, for trail runners, and super fun :) It felt like we'd been along this part of the trail before, but I let that thought enter then exit my mind. Then we got to another section that was also very familiar feeling. Huh. That's weird. Once we got to the grassy fork in the trail, we both knew it. "We've totally run this section already." Geof voiced what I was thinking. Crap. I was willing to think that maybe this was a section that gets repeated (I didn't study the course map that closely), but when the super fasties up front whizzed by us from behind, and when we came up on folks we knew were way behind us earlier, we really knew something was amiss. I can't believe this is happening, where did we go wrong? We were talking through the course, trying to figure out what happened and what we needed to do. Geof's frustrations were mirroring my own and I let him air them while I ran quietly beside him and listened. I was waging the same war within, but knew it would do no good to let it out and have both of us freaking out. Why did they have to go and tell me I was in second? This totally makes this feel even worse! We pulled into Scuppernong...again...this time from the other side and Geof began talking to a volunteer that asked us something. I was in tunnel vision mode. I only recall that the volunteer already knew there was a course issue and he assured us they were working on it. "Yes, but now where do we go?" We were pointed out and we headed down the trail we just came from. "What the hell is going on?" We were both baffled. While Geof voiced his concerns, I was folding into myself making sure I stayed in the moment and didn't let this minor hiccup overtake my loosening grasp on my mental stability. This was something new to me. I've never gotten lost in a race before, and somehow having had no control over its occurrence made it even more frustrating. This was a new kind of mental battle, and it was exhausting! I stayed very quiet, and any words or sounds I let escape my mouth I made sure to be as upbeat-sounding as possible. I couldn't believe how much this was bothering me, and how massively we were both tetering on the brink. What a strange experience! We finally rolled into the race's 11+ mile aid station and a volunteer outfitted in walkie talkies and maps approached us asking how many loops we had run near Scuppernong. We weren't sure, but we knew we were at least a few miles further in than we were supposed to be at that point. He showed us a map and indicated that we must have run two loops (an extra 2.4 miles) and that a handful of the front-of-the packers* had done this, having been routed incorrectly by a misinformed volunteer (but we also heard there was some tampering with course-markings by hunters...who knows what really happened). They were apparently working on 'fixing' it somehow. This provided a tiny amount of relief to me, though I didn't want to get my hopes up about anything. We grabbed some more water and charged out of there, on a mission. *Turns out that some fasties had actually been shorted some miles, while we were given bonus miles. This caused mass confusion for some and ultimately spelled the demise of a few of the front runners shortly thereafter. What a weird day! I began to work through things in my head as we ran along silently, letting the new information sink in. 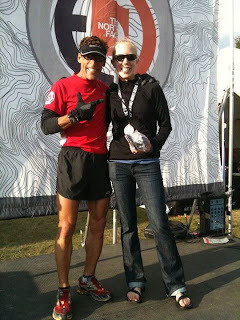 Okay, so we ran some bonus miles, who cares, this is an ultra, it happens. Maybe we readjust our goal a little. Sub-10 hours isn't entirely impossible at this point...I'll be happy with 9:59 :) Get over yourself, this is just a training run! As the morning progressed and we continued to move along really well, the mood began to lift for us both. Having run in comtemplative silence for a time, we started to talk about how incredibly draining that first bit was. Geof had no idea how much it bothered me since I kept so quiet. I said I was just trying to work on it without losing it, a la 2010 Rocky Raccoon 100 :) I could finally turn my attention to other things, like enjoying myself! Ahhhh, bliss. Oh, lookie here, that's a whole lotta horse poop on the trail! I was taking a quick inventory on things...stomach felt great, head felt very good, mind was a little exhausted but getting better, legs felt fatigued from the hard push early on, and the ensuing adrenaline rush. A heavy mind game not only effs with your head, but also manifests in other ways. Like making your legs feel like you've got 30 miles in them, rather than 15. But that all eventually worked itself out. We even found ourselves laughing about the whole thing at points. I was holding onto the idea that they would 'fix' the situation, but also feeling very okay with them not fixing it, and just tacking on those bonus miles. I was finally just rolling with it. Anywho, back to the action! 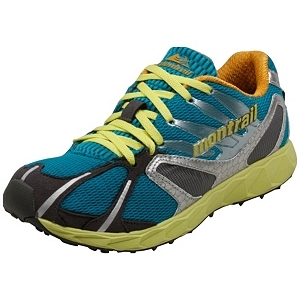 I was running in my brand new La Sportiva Wildcats, and was thrilled that I decided to go with those shoes. My feet felt awesome. I ran with just one water bottle (filled with...water), and munched on my Honey Stinger waffles or chews about every hour. I also took an S!Cap about every hour or so. I am stoked with how well my stomach held up, and that I managed to completely avoid getting bloated at any point. Double score! So, I've at least got the nutrition thing down for 50 miles and under :) I sipped on Mt. Dew or Coke at a couple aid stations, but I think that's the only other thing I ingested. Somewhere in the marshy section of the course, where there's a bunch of boardwalks, Geof ran ahead to make a pit stop, and I took a walk break to eat another Waffle. I had just opened up the package, taken a little bite, and BAM! I was down. It was the flattest, smoothest section of the course (other than the pavement) and I bit it hard. I hit my right knee in the same spot I smacked it last month; that's gonna be a scar. My first thought being, "where's my waffle?!" And the next thought being, "I wonder how funny that must look to someone watching me fall like that." My poor waffle fell in a dusty mud patch. Five second rule! I dusted it off, did a once over and decided that if I was going to get sick from it, it probably wouldn't happen until much later. Totally worth it. With that, I ate that dirty waffle. And it was good! The sand and dirt just gave it a little extra crunch. As I walked off the stinging pain working its way around my knee, Eric B and a couple other guys ran past me. Geof appeared out of the woods up ahead, and I informed him of my date with the dirt, and showed him my bloody knee. Once the pain subsided, we picked it back up. Much better :) We caught back up to Eric and his crew and moved past them..."She can't make up her mind!" Geof jokes as we run by. From here, things are a little fuzzy. There was a LOT of running. A lot of smiling. A lot of being blown away by how beautiful the day, and the course, was. Mile 21ish is McMiller AS, where we had our one drop bag. This was our "big" stop of the day and we took a couple minutes to empty our shoes, grab some more nutrition, and to use the potty. The volunteers at each aid station were taking note of our arrival each time, and kept reassuring us they were probably going to be stopping us 2.5 miles before the finish line and giving us our finish time at that point. Okay, cool. I'll get excited about that if it happens :) We still didn't know what to expect, but we were enjoying ourselves too much to worry about it much. Heads down, we pushed it. I was noshing on my pink lemonade Honey Stinger chews (which are the sweet elixir of life, by the way) and focusing like a fiend. We're totally going to do this. Who'd of thought?! We re-entered that nemesis/Groundhog Day loop, this time running in reverse, headed for some unknown spot where our official race would end. The trail was incredibly sandy here and we were flanked by soaring pine trees. It was beautiful. As the trail turned uphill for a ways, I glanced up and in the distance noticed two people sitting alongside the trail, near the top of the climb. I wonder...already? It was a little exciting to think we were really almost done, not gonna lie. There was much food and beer to be had at that finish line! As we got closer and closer, the two people stood up and walked toward the center of the trail, shouting for our bib numbers. "45 and 46!" "Alright, you guys are done! If you want to continue on and run through the finish line, go ahead. Or we can drive you back to the finish and you can run in the last 100 yards." What do we look like, wussies? "We're going to run it in, thanks." 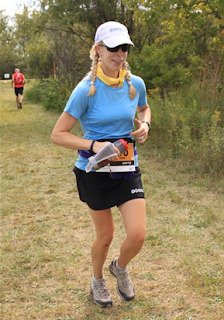 And with that, she issued us our official finish times and smiled as we continued on up the trail. Not only did we crush my 50 mile PR (by about 1.5 hours), but we also managed to smash Geof's 50 mile PR (by a little more than 20 minutes). Who are we? The official chip time: 8h:35m:34s. 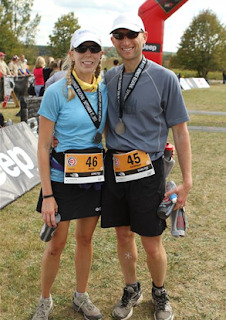 Fueled by our accomplishment, we high-tailed it in the rest of the way, running on such an enormous endorphin high I felt completely weightless. Wow, what a run!! See, I told you it was going to be a good day. And we totally brought the boomshockalocka. What a neat experience, and, perhaps moreso, what a top notch mental learning experience. To go through that mental roller coaster so early in the race, to be so present and to work through it without losing too much cool, and then to come out the other side of it is probably an even more delicious victory. I'm not gonna lie, that was tough to do and took a lot of energy. A handful of fasties dropped as a result of that problem, and I can see why. It's not easy to manage, and it totally throws you off your game. I don't wish it on any runner! After practically inhaling a plateful of pulled pork, salad, some soup, and some delightfully refreshing beer in the beer tent, we caught up with the Brelly, and friends running the race. I ended up placing first in my age group, and 6th woman overall. 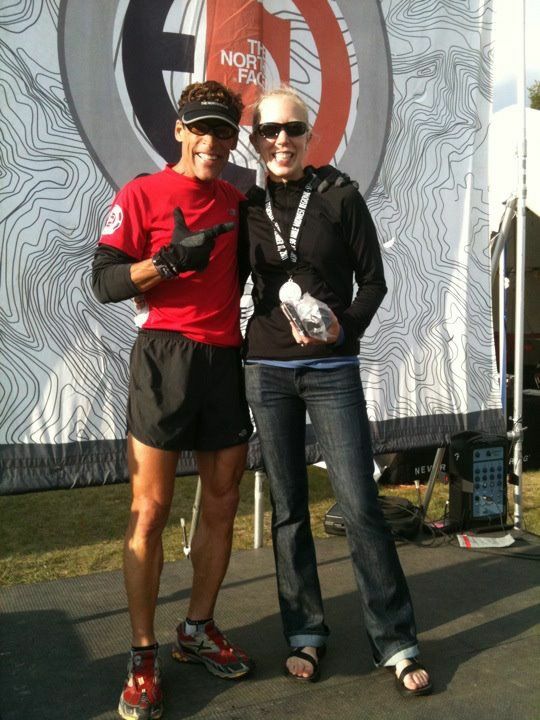 This meant a handshake from Dean Karnazes himself and a picture :) Oh, and another pair of those rockin' North Face arm warmers. Those things are NICE! Seriously, his leg muscles look like that all the time. Sick. I've probably left out a ton of stuff because my mind is still swirling, but that's the gist of it :) I'm very, very happy with how it all went, and feel really, really good about how my training has gone thus far....both physically and mentally. It's been a...BUSY...week this week. 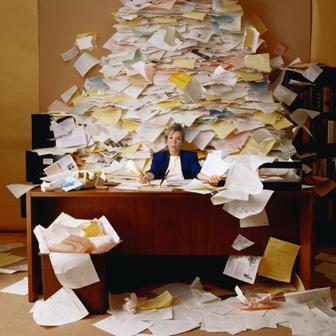 But that's a very good thing...being busy has helped prevent a lot of my usual taper week crazies. And, I've managed to make it through the whole week with only one complaint of aches and pains. Usually I find 46 other aches and pains to agonize over during taper week. So I've done very well this time around. This may be due in part to finally actually being f'real trained for a race longer than 30 miles. Solid training kills the crazies. True story. 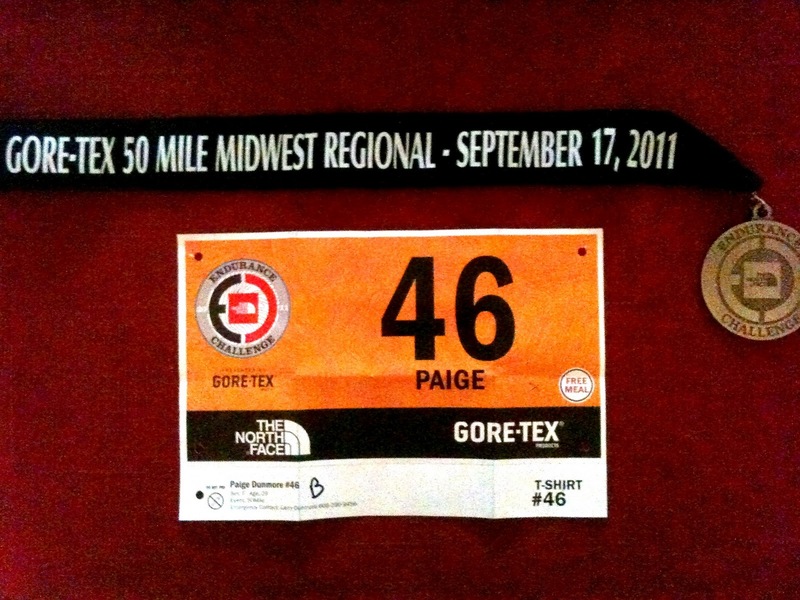 Anywho, tomorrow morning at 5:00 we line up to run the North Face Endurance Challenge Midwest Regional 50 Mile Run. That's a really long name. 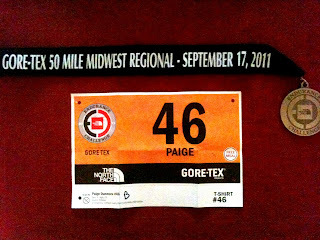 This will be my fifth 50 mile event, and my 14 official ultra (I don't count the fat asses or my lame DNF at Leadville). Heh, that's not a lot compared to some, but I didn't realize I was already in double digits. 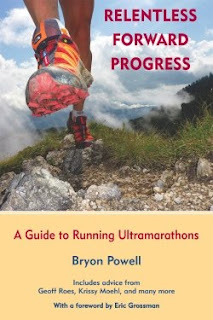 I'm still a freshman ultra runner, for sure! If this were high school, the seniors (aka Veteran Ultrarunners) would toss pennies at me as I walked down the hall. At least that's what they did at my high school (but since everyone knew my older brother (and his penchant for...regulating) I was saved from the penny misery, among other freshman ailments :) But, that's a hilarious story for another day!). I feel kinda nervous for tomorrow, but not overwhelmingly so. It'll be the furthest I've run since last September, at Rio Del Lago 100M, but only by about two miles (I did manage close to 49 back in July...severely undertrained). But still. It's kinda intimidating. 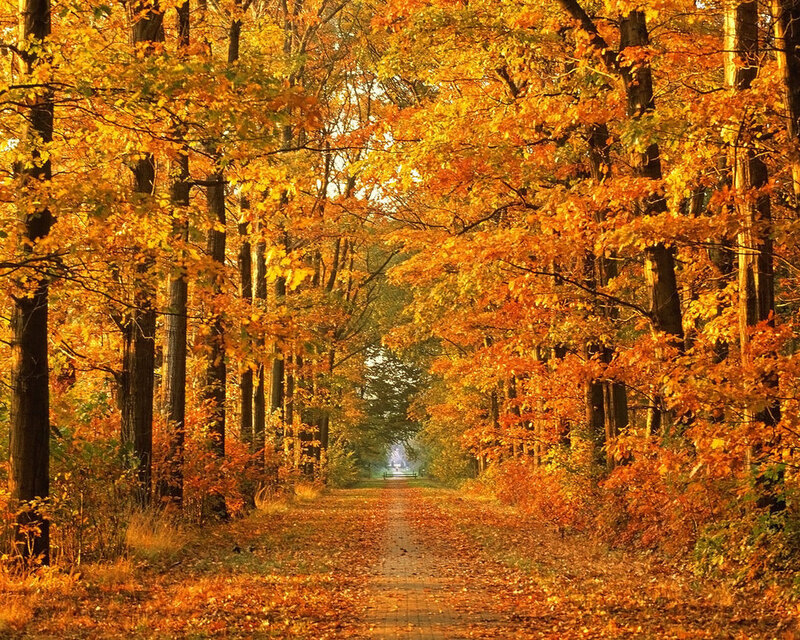 Enjoy this most glorious of weekends and get outside! The peeps over at Venturepax e-mailed me back in July to tell me about their new site and to see what I thought of it, being a member of that outdoorsy, we-are-the-world, borderline-urban-tree-hugger crowd, they thought it sounded up my alley. Usually I ignore solicitation-y e-mails...but, this guy, Danny, knew exactly how to catch my attention: outright flattery. Flattery, and compliments on my writing, will get you everywhere. So I decided to check it out, liked what I saw and decided it's a pretty good fit here since we're all outdoorsy n' stuff. "Here at Venturepax, we like to leverage technology to help people get outside. We do this by making it easy to find and share outdoor experiences and actually reward our users for getting outside and sharing their pictures, videos, stories, etc.!" I also get a kick out of their Declaration: "Today, we declare that sitting inside staring at the television for hours on end is no longer allowed. 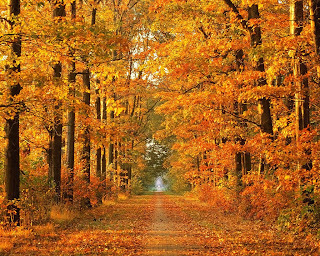 We believe in the great outdoors and all that it inspires. That families who play together, stay together, and that fitness can come from fun."